As mentioned above, the Michigan Catastrophic Claims Association was created by the legislature in 1978 to address the problem that many insurers were unable to afford reinsurance protection for the portion of unlimited PIP coverage that they were financially unable to retain as their sole responsibility. Under the MCCA's excess reinsurance, a primary insurer pays a reinsurer to cover the amount of a claim in excess of a fixed level, known as a "retention." When the costs of a claim exceed that retention level, the reinsurer pays that portion of the claim or reimburses the primary insurer. This prevents a primary insurer from being made insolvent by a single large claim. Different retentions are appropriate for different insurers, depending on factors such as size. However, the MCCA legislation mandated participation by all insurers at a $250,000 level. This was too large for some insurers, which had to buy additional reinsurance to cover the gap between an appropriate retention and $250,000. Larger insurers had to pay for reinsurance at that level whether they needed it or not. In essence, this fixes prices for reinsurance. Consumers cannot benefit from lower premiums resulting from reinsurance savings that efficient primary insurers might otherwise obtain. 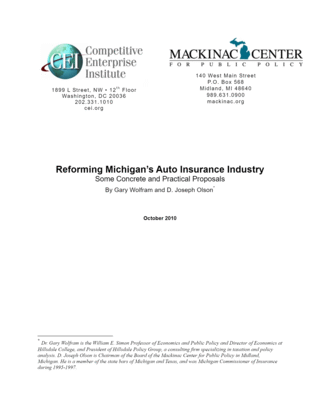 Legislation passed in 2001 implemented gradual annual increases in the MCCA retention, up to $480,000 effective July 1, 2010, then to $500,000 effective July 1, 2013, and thereafter increased biennially by 6 percent or by the same rate of increase as the consumer price index (CPI), whichever is less. None of these retentions is any more appropriate for any particular insurer than the original $250,000. The arbitrary nature of these increases is evidenced by the fact that in 2001 a legislature that was interested in adjusting the retention to reflect CPI increases would have raised the original $250,000 retention to approximately $800,000, rather than the $300,000 it actually mandated for 2002. The MCCA is required to calculate annually the total premiums that will be needed to pay all claims that will be incurred in the ensuing year. This immediately proved difficult (something that private reinsurers already knew and that explains their reluctance to provide the reinsurance for an unlimited amount). That total is then assessed to all insurers according to the number of vehicles each insures. Technically the assessment is calculated on a "car year" basis — one year of coverage for one car. The assessment for the first year was $3.00. By the 10th year, the amount had increased to $22.67 — $15.77 to cover the year's anticipated losses, $6.81 to apply to prior year deficits, and $0.09 for MCCA expenses. In later years the assessment has ranged between $5.60 and $143.09. For the year beginning July 1, 2010, the largest assessment on record consists of $116.84 to cover the year's claims and $26 to reduce a deficit, and $0.25 to cover MCAA administrative costs. Some critics have contended that the volatility in assessments results from mismanagement or incompetence, but in fact it is caused by PIP coverage being unlimited. When an accident occurs, an insurer must establish a liability, known as a reserve, on its books equal to the total anticipated payments it will make on the claim. For serious accidents, this can amount to hundreds of thousands of dollars per year for many years in the future, often for the lifetime of the injured person. When notified of the loss the MCCA must establish a reserve for the amount in excess of the retention. If the MCCA set such reserves for the total amount that would be paid over time, the annual anticipated losses that help determine its required annual premium would be dramatically increased, resulting in enormous increases in that premium and thus in per-vehicle assessments as well. These claims will be paid out over long period, so the MCCA does not need to collect all the money at once. Instead, it discounts the reserves based on anticipated investment income it will receive over the duration of the claim payments. This discount reduces the amount needed for assessments. Meanwhile, medical costs are likely to increase over time, so the MCCA includes these increases in its calculation, thus increasing the amount it might otherwise need to collect. Anticipated investment income normally exceeds the anticipated increase in medical costs, so the net effect is to reduce the estimate of premiums and assessments needed to pay all the claims. This discounting has a dramatic effect. In 2010 the future payments for 12,404 active claims are expected to exceed $71 billion, but the discounted reserves are about $12.7 billion. The difference is billions of dollars that did not need to be collected. Nonetheless, the rates assumed for investment income and medical inflation are necessarily estimates. No one can be certain of investment returns over the next several decades, and no one can be certain of how much medical costs will increase. No one can even predict the cost of claims in the next year. Conditions change over time. The MCCA must acquire as much information in these areas as possible and adjust its assumptions about interest rates, stock market returns, inflation, and claims trends. There are additional unintended consequences arising from the methodology chosen by the legislature to determine the per-vehicle assessments each year. That assessment is determined on a car-year basis (a unit of measurement to which a rate is applied to determine a premium). Regardless of the type of motor vehicles insured by a company, the per-vehicle charge for a particular year will be the same for all vehicles. No consideration was given to the possibility that the actual claim cost for some classes of motor vehicles would vary significantly from the average charge imposed by the MCCA. One of those classes is historic vehicles, which were legally recognized as an exception in 2003. Under this exception, the charge for "historic vehicles" is 20 percent of that for other vehicles. The 20 percent charge was not based on any data about the actual costs of that class, but was a political concession to a special interest group whose vehicles obviously have smaller exposure to catastrophic losses. At the time of that legislative change, a more significant class with claim costs well below average — which had actually been measured by the MCCA — was brought to the attention of legislators. Commercial vehicles, based on an actuarial analysis of the period from September 1, 1996, through December 31, 2001, had an average annual MCCA-covered loss of $10.78 per vehicle. Private passenger cars had an annual average of $62.31. The annual average for motorcycles was $151.04. But all three were charged the same annual assessment. An example of the impact of this scheme is the 2002 MCCA assessment of $71.15 per vehicle. Had that assessment been distributed among the three classes in proportion to the MCCA claim costs of the previous five years, commercial vehicles would have paid $12.77, motorcycles $179.04, and private passenger vehicles $73.85. Commercial vehicles subsidized the other classes to the tune of $58.38 per vehicle for a total overcharge of approximately $29 million, based on an estimate of 500,000 insured commercial vehicles. The reason for the much smaller per-vehicle claim costs for commercial vehicles is that when an employee is injured in a commercial vehicle, and insurance is available from both the employer's workers' compensation and automobile policies, the workers' compensation policy pays first. The employer pays the cost of the injuries through its workers' compensation policy, but then, because of the MCCA subsidy, has to pay again for the injuries through its automobile policy premiums. The extra $29 million could have helped create a lot of jobs in Michigan. The legislature addressed the issue of commercial overcharges in 2003, but due to the opposition of insurers that wrote predominantly personal lines and that apparently did not want to see a $2.70 (3.8 percent) increase in the per-vehicle assessment paid ultimately by their customers, the subsidies continued. As a result, no action was taken, and the MCAA overcharges — of 450 percent on Michigan businesses — have continued to the present day. As noted, the MCCA assessment is now significantly higher than in 2002 and has been so for all the intervening years except 2003, when it was $69.00. The negative impact on Michigan business investment has therefore probably been even greater than in the above example. The MCCA's board should initiate a study to determine that economic damage. Lawmakers should change the law to require that commercial vehicles be assessed by the MCCA based upon their actual claims experience.